From a logistics standpoint, recording vocals in your home studio seems like one of the easiest things to do. It’s a single microphone, and an artist and engineer can simply track with headphones, together in the same room, with no iso booth. Forget painfully loud guitar amps or drums; it’s a quieter, intimate arrangement that usually won’t set off the neighbors or require extensive set-up. From there, it’s a matter of understanding some common problems that occur when recording vocals and how to prevent them! The the human voice’s exaggerated “p” and “b” sounds, called plosives, can result in distinct popping sounds on a vocal track. In speech we don’t even notice them, but when the acoustic energy of a plosive hits a microphone diaphragm, it’s obvious. Pop filters are simple devices designed to reduce the energy behind plosives. You’ve probably seen them as a round mesh circle attached to a mic stand, separating the vocalist from the mic itself. They can also be built in on certain specialized shock mounts. They do a pretty good job for the most part, but there are other precautions you can take to reduce popping. For one, keeping the vocalist a safe distance (maybe 4-6 inches, or even more) from the mic capsule is a healthy practice. This is especially true of cardioid mics prone to proximity effect. If you weren’t able to minimize popping while tracking, you can also target the most offensive low-end plosives with EQ while mixing. Our voices are full of unpleasant frequencies, aren’t they? Opposite plosives are the shrill “s,” “t,” and “ch” sounds, called sibilants. Sibilance is the harsh hissing sound that the mic picks up when recording. Some voices are more sibilant than others, but there’s a little bit of it in everyone. Addressing the problem in the mix is most common, using a combination of surgical EQ and de-essing to reduce the unwanted harshness. You could also have the vocalist sing slightly off-axis to the capsule (this works on plosives, too!). However, there’s an old trick which involves rubber-banding a pencil to the microphone vertically across the capsule. The idea behind this is that the highest sibilant frequencies are split in half, diverting them away from the diaphragm. Try it out if you’re struggling to reduce sibilance when recording vocals. No matter what you do, if your room sounds terrible, your vocal takes will suffer. In an untreated space, frequencies bounce around and subsequently amplify each other or cancel each other out. The result is called comb filtering–a frequency response with sharp peaks and troughs resembling a fine tooth comb–which makes your vocal takes sound thin and phase-y. The best way to avoid comb filtering and unwanted reflections is through proper acoustic treatment. At the very least, treating the first reflection points will greatly improve the mix position, and in a smaller room, vocal tracking will be assisted as well. Companies manufacture dedicated “reflection filters,” though their indicated use is misguided. They’re advertised as attaching to a microphone stand and creating semi-circle behind the mic. At 180 degrees off-axis (behind the mic), there’s already 100% rejection anyway! You’d be better off with a filter behind the vocalist, where reflections from over the singer’s shoulder enter the microphone on-axis. Something like the Kaotica Eyeball isn’t a bad option for totally untreated rooms, or just that added amount of vocal isolation. As the engineer at your home studio, you will have hopefully set everything up for success. 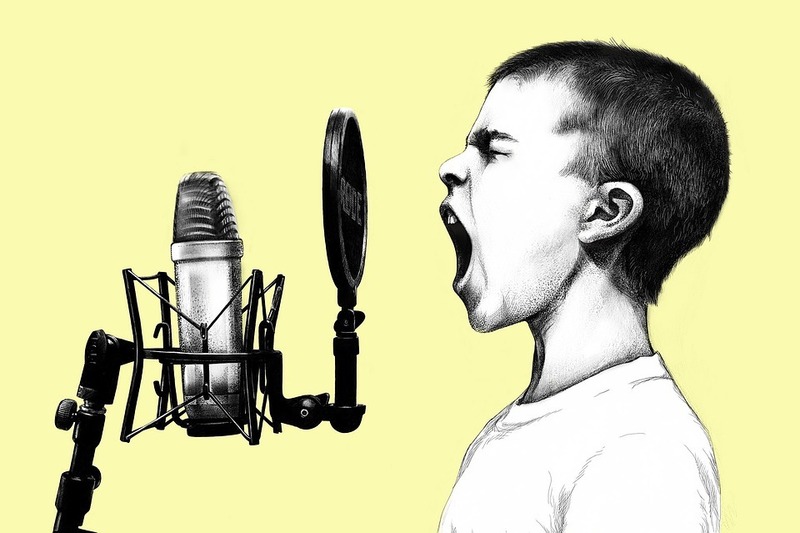 After you’ve considered a few of the biggest issues associated with recording vocals, you’ll want to be familiar with how vocalists themselves interact with the microphone. A great, experienced singer may control his or her dynamics naturally by changing their distance from the mic. For example, moving away during the loudest parts and closer during the quieter parts. In these cases they’re acting as their own compressor, controlling the dynamics of their performance by being aware of their physical proximity to the mic. Again, some experienced vocalists might learn to control the loudness of their breath in the microphone. Some breath is actually a really cool effect, and eliminating it entirely takes away from the intensity and interest of a performance. But by turning his or her head to the side for a big inhalation, the vocalist can reduce editing work needed later on! Veteran performers may have picked up on some of the sounds engineers work so hard to remove during editing and mixing and learned to manage them themselves. By adjusting distance from and angle to the mic, a singer can effectively control the barrage of “p,” “b,” and “s” that we meticulously chip away while mixing. The truth is, when we’re starting our careers or just having fun at home, we’re not going to be working with the most amazing artists all the time. That isn’t to say they’ll be untalented, but they likely won’t have the experience or awareness to control the more technical side of recording vocals. The artist is simply there to freely express, and the rest of the work is left to us. It’s up to the home studio engineer, then, to be both coach and cheerleader when working with less experienced singers. When we understand how to reduce plosives, sibilance, proximity effect, etc. we can set up with right gear and even suggest where the vocalist stand. When we’re familiar with the performance after a few takes we can make note of the loudest and quietest parts, encouraging the vocalist to “step back a bit” or “get in close” for different parts of the song. In the home studio, which is much more intimate than a professional one, we’ll probably be acting as producer and engineer simultaneously!